Heat oven to 400°F. In small bowl, mix 3/4 cup flour, 2 tablespoons sugar and the salt. With pastry blender or fork, cut in butter until mixture resembles coarse crumbs. Stir in 2 tablespoons of the melted chocolate. Reserve remaining chocolate for filling. Press crumb mixture in bottom of ungreased 9-inch springform pan. Bake 10 minutes or until very light brown. Remove pan from oven. Reduce oven temperature to 325°F. Meanwhile, in large bowl, beat cream cheese and 1 cup sugar with electric mixer on medium speed until light and fluffy. Beat in 1/4 cup flour and vanilla until well blended. On low speed, add eggs 1 at a time, beating just until blended after each addition. Add sour cream; blend well. Place 1 3/4 cups filling mixture in medium bowl; stir in reserved melted chocolate. Pour half of plain filling over crust. Top with spoonfuls of half of the chocolate filling. Cover with remaining plain filling, then with spoonfuls of remaining chocolate filling. With table knife, swirl chocolate filling through plain filling. Place cheesecake in center of oven. Place shallow pan half full of water on bottom oven rack under cheesecake. Bake 1 hour to 1 hour 15 minutes or until set but center of cheesecake still jiggles when moved. Cool on wire rack 10 minutes. Run knife around edge of pan to loosen cheesecake. Cool at least 2 hours. Refrigerate 8 hours or overnight before serving. Carefully remove side of pan. Store in refrigerator. For the best results, beat eggs just until blended. 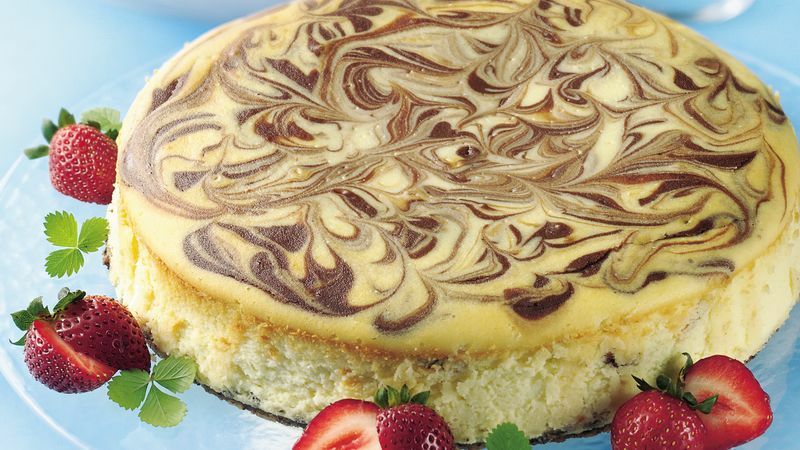 Overbeating the eggs can cause cracks in the cheesecake.